To restate again, repeatedly, the Missouri Revised Statutes Chapter 455, and more specifically Abuse—Adults and Children—Shelters and Protective Orders Section 455.035, under section 455.070 definition states - sections "455.010 to 455.085 are independent of any proceedings for dissolution of marriage, legal separation, separate maintenance and other actions between the parties" and then invites "any other available civil or criminal remedies" i.e., a federal civil rights, 42 U.S. Code § 1983/1985 and 18 U.S. Code § 242/241, remedy for the petitioner from those acting or conspiring to act under color of law and/or a common law remedy, civil and criminal, for the conspiracy to defraud the petitioner from those acting in their personal interest alone. The warrant, an ex parte order of protection, included the sworn petition  that reasonably, per the 4th Amendment, and the statute limited the jurisdiction for the Judicial Act. The fraudulent petition, fraus omnia corrumpit, signed and dated by the criminal respondent, Sharon G. Jeep in a conspiracy with her daughter, my former stepdaughter Kristen M. Capps, listed a BONDED misdemeanor traffic violation as the asserted "probable cause" for the NOT "facially valid" ex parte order of protection. The issuing sincerely ignorant and/or conscientiously stupid Judicial officer, one Judge Joseph A. Goeke III, obliviously did not read Sharon G. Jeep's hand written criminally fraudulent petition, in 2003, or did not care what "subject matter"  the statute mandated for a reasonable ex parte order of protection i.e., "for good cause shown in the petition… An immediate and present danger of domestic violence." The warrant/order that included and was limited by the respondent's, Sharon G. Jeep's hand written fraudulent petition,  as its jurisdiction, was THUS not a "facially valid court order." Judge Joseph A. Goeke III clearly had no "subject matter"  reasonable jurisdiction for the statute's stated "subject matter," "An immediate and present danger of domestic violence," based on the respondent's, Sharon G. Jeep's, submitted fraudulent petition dated November 3, 2003. 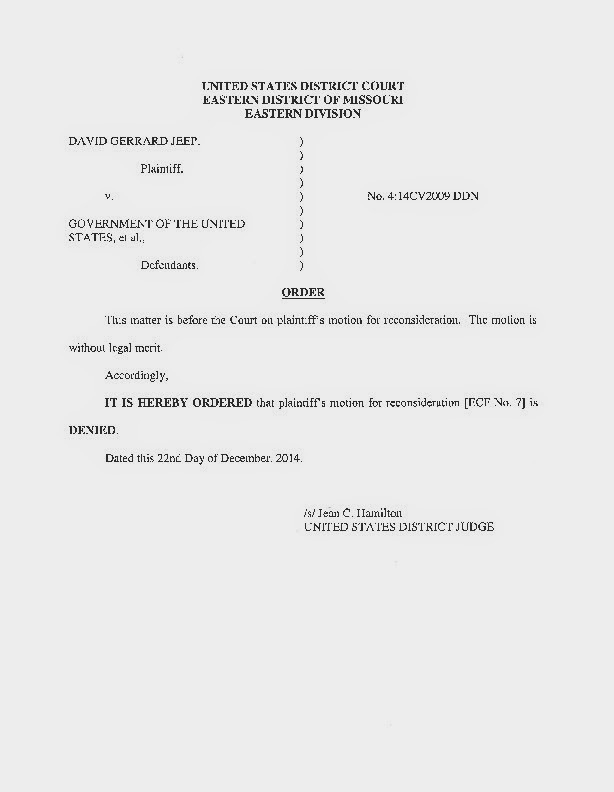 Judge Joseph A. Goeke III had no "personal jurisdiction," in that the issue, the alleged misdemeanor traffic violation, was already under the bonded personal jurisdiction of another judge, Associate Circuit Judge Jack A. Bennett of 26th District of Missouri; based on the respondent's, Sharon G. Jeep's, submitted fraudulent petition dated November 3, 2003. Judge Joseph A. Goeke III had no "geographic jurisdiction," in that Judge Joseph A. Goeke III was a part of the 21st District of Missouri in St. Louis County some 170 miles away from the site of the alleged BONDED misdemeanor traffic violation and Associate Circuit Judge Jack A. Bennett in the 26th District of Missouri, Osage Beach, Camden County Missouri; based on the respondent's, Sharon G. Jeep's, submitted fraudulent petition dated November 3, 2003. For me the supreme Law of the Land has always been self-evident and should have always been self-evident to any, not sincerely ignorant or conscientious stupid, person. Therefore I have always AND I STILL DO stress the 7th Amendment, resultant common law remedy, for damages, link between the NOT "facially valid" criminally fraudulent ex parte order of protection and "the custody and property settlement." I have always asserted it AND I STILL DO that it is self-evident that the Constitution for the United States of America Article VI. Second paragraph, 1st, 4th, 5th, 6th, 7th, 8th 13th and 14th Amendments to the Constitution for the United States of America, Civil Rights Act of 1866, Civil Rights Act of 1871 and Civil Rights Act of 1875/1964 take precedent over Kahn v. Kahn, 21 F.3d 859, 861 (8th Cir. 1994) as the supreme Law of the Land; and the Judges in every State shall be bound thereby, AND I STILL DO. From its inception liberty of the individual person was secured by the Constitution for the United States of America and the treaties and laws made under its authority ALONE, via a BICAMERAL, judge and jury's, Due Process, NOT ON ANYONE'S PREROGATIVE. All the respondents, as individuals and government actors under color of law, have used the unconstitutional prerogative of their sincere ignorance and conscientious stupidity to deprive the PRIMARY governmental authority of the preamble's security to "establish Justice." With their sincere ignorance and conscientious stupidity unencumbered by competence, reason or justice the respondents have REPEATEDLY using their prerogative alone acted to the deprivation of the petitioner's rights, privileges, or immunities secured by knowledge, reason, justice and the Constitution and laws of the United States of America. I seek relief from the criminal fraud and the "under color of law" unconstitutional deprivation of the petitioner's rights, privileges, or immunities secured by reason, justice and the Constitution and laws of the United States of America starting on Saturday May 17, 2003 with the incompetent unconstitutional allegation of a misdemeanor traffic violation and engorged on Monday November 03, 2003 08:00 PM with the facially invalid fraudulent ex parte order of protection issued in a complete absence of all jurisdiction and now still ongoing. The deprivation is ongoing. Damages are ongoing and escalating. It has been ongoing for nearly 4,239 days since this originated with the unconstitutional, sincerely ignorant and conscientiously stupid alleged traffic violation on Saturday May 17, 2003 and then enlarged on Monday November 03, 2003 08:00 PM with the at issue corrupt, malicious, sincerely ignorant and conscientiously stupid warrant/order taken with "a complete absence of all jurisdictions." Please accept the enclosed NOTICE of APPEAL based on the corrupt, malicious, sincerely ignorant and conscientiously stupid actions of this court and others. Please accept the enclosed courtesy copy of the above referenced issue. I understand that when you receive confirming NOTICE OF APPEAL from the circuit court you will then be contacting me for confirmation of MOTION TO PROCEED IN FORMA PAUPERIS. See SCANNED copy of the hand written petition dated 11-03-03, as attached to the original petition dated 12-03-14 that formed the EXCLUSIVE basis for the ex parte order of protection and certifies the complete lack of jurisdiction with its very existence as served on 11-03-30 at the end of this petition. fraus omnia corrumpit Fraud unravels it all i.e., the divorce and custody order. There is a strong legal principle adopted internationally that a party who obtained an award through fraud should not be entitled to keep that award. Fraud cannot be allowed to pay. The assertion of a misdemeanor traffic violation does not provide probable cause for a ex parte restraining order. Clearly based on the original SERVED handwritten petition dated 11-03-03 as provided here, there was a complete absence of jurisdiction for the stated charge. "Consequently, it (the judge's order) can be facially invalid only if it was issued in the "clear absence of all jurisdiction." Stump v. Sparkman,435 U.S. 349, 356-57, 98 S.Ct. 1099, 55 L.Ed.2d 331 (1978) (citation omitted)." Id." PENN v. U.S. 335 F.3d 790 (2003). See originally petition provided SCANNED copy of the hand written petition that asserts ONLY the complete lack of jurisdiction with its very existence as served on 11-03-30. Stump v. Sparkman, 435 U. S. 356 NOTED exception Footnote 6 - "A distinction must be here observed between excess of jurisdiction and the clear absence of all jurisdiction over the subject matter. Where there is clearly no jurisdiction over the subject matter, any authority exercised is a usurped authority, and, for the exercise of such authority when the want of jurisdiction is known to the judge, no excuse is permissible." Bradley v. Fisher, 80 U.S. 351 (1871)"The Court of Appeals correctly recognized that the necessary inquiry in determining whether a defendant judge is immune from suit is whether, at the time he took the challenged action, he had jurisdiction over the subject matter before him." Missouri Revised Statutes Chapter 455, Abuse—Adults and Children—Shelters and Protective Orders Section 455.035 – "Upon the filing of a verified petition pursuant to sections 455.010 to 455.085 and for good cause shown in the petition, the court may immediately issue an ex parte order of protection. An immediate and present danger of domestic violence to the petitioner or the child on whose behalf the petition is filed shall constitute good cause for purposes of this section. An ex parte order of protection entered by the court shall take effect when entered and shall remain in effect until there is valid service of process and a hearing is held on the motion." The assertion of a misdemeanor traffic violation does not provide probable cause for a ex parte restraining order. Clearly based on the original SERVED handwritten petition dated 11-03-03 as provided hear, there was a complete absence of jurisdiction for the stated charge. "Consequently, it (the judge's order) can be facially invalid only if it was issued in the "clear absence of all jurisdiction." Stump v. Sparkman,435 U.S. 349, 356-57, 98 S.Ct. 1099, 55 L.Ed.2d 331 (1978) (citation omitted)." Id." PENN v. U.S. 335 F.3d 790 (2003). "A distinction must be here observed between excess of jurisdiction and the clear absence of all jurisdiction over the subject matter. Where there is clearly no jurisdiction over the subject matter any authority exercised is a usurped authority, and for the exercise of such authority, when the want of jurisdiction is known to the judge, no excuse is permissible." Bradley v. Fisher, 80 U.S. 351 (1871) AND Stump v. Sparkman, 435 U. S. 356 NOTED exception Footnote 6 - ibid. Stump v. Sparkman, 435 U. S. 356 NOTED exception Footnote 6 - ibid. Missouri Revised Statutes Chapter 455, Abuse—Adults and Children—Shelters and Protective Orders Section 455.035 – ibid. 8th Amendment to the United States Constitution…"Excessive bail shall not be required, nor excessive fines imposed, nor cruel and unusual punishments inflicted." Beyond the "complete lack of jurisdiction" STRESSED in the original order at the center of this issue, the Order created an infliction of a "cruel and unusual punishments" for an ex parte order of protection i.e., a misdemeanor traffic violation as probable cause for an ex parte order of protection is "cruel and unusual" to say the least. The Civil Rights Act of 1964 (Pub.L. 88–352, 78 Stat. 241, enacted July 2, 1964) is a landmark piece of civil rights legislation in the United States that outlawed major forms of discrimination against racial, ethnic, national and religious minorities, and women. THINK!!!!! PLEASE THINK!!!!!!!!!!!!!! What is the cost of one young black male and two police officers? What is the cost of one young black male and two police officers? With the recent death in Ferguson Missouri, Michael Brown and the two police officers in New York city, Wenjian Liu and Rafael Ramos. I thought it migh be interesting to look at the cost. Now to the victims' families, I IMMEDIATELY APOLOGIZE, there is no putting a cost on an individual's life. What I am attempting to do is look at it more detached so that we can learn more from the issues. What is the cost of one young black male and two police officers? Now you really can't come up with a cost for one individual "young black male." But with the additional information for "two police officers," statistically at least you can generically attempt it. I live in St. Louis Missouri. In the park between the Courts Buildings and the City Hall we have statues honoring the fallen dead of our police force (50 in 200 years) and our firemen (5 in 200 years). Now a few years ago we were forced to pay policemen and firemen on an equal scale, because arguably both professions were asserted equally at risk of their life in our defense. The national average mortality rate on the job for all occupations is 4 deaths per 100,000 workers. Sanitation workers picking up our trash cans on our neighborhood streets die on the job (29/100,000) at 152% that of Police Officers (19/100,000) and 1160% of Firemen (2.5/100,000)!!! Statistics when presented by fools to promote their agenda can corrupt us!!! Now statistics can be skewed in professions i.e., commercial fishing for example where there are by order of magnitude many fewer workers. But that reasoning does not govern professions like REFUSE AND RECYCLABLE MATERIAL COLLECTORS v POLICE AND SHERIFF'S PATROL OFFICERS where there are comparable total numbers of each. The heroes that work as REFUSE AND RECYCLABLE MATERIAL COLLECTORS ought to be paid commensurate with the risk level in their profession and receive a "3 percent at 50″ retirement plan courtesy of taxpayers. Now what I think we need to do is not so much pay police and firefighters less but, WE NEED TO STOP ROMANTICIZING the professions. Police do not need to carry guns, many first world nations have never allowed their police force to carry guns, the United Kingdom for example. BUT MORE IMPORTANTLY we need to take away their immunity for "knowingly false testimony by police officers" (Briscoe v. LaHue, 460 U.S. 345 (1983)). The people of Fergusson Missouri are, I would assert reasonable, 10 times more afraid of "absolute immunity" for "knowingly false testimony by police officers" (Briscoe v. LaHue, 460 U.S. 345 (1983)). I know in my case I have for 11 years now, with definitive undisputed evidence of the "knowingly false testimony by police officers" (Briscoe v. LaHue, 460 U.S. 345 (1983)) on a DWI been UNABLE TO GET JUSTICE. But more about that later. As regards Fireman we need to stop paying them so much for so little. Firemen in middle class suburbia can go MONTHS without actually even seeing a fire, sometimes YEARS!!!!! "Immunity is given to crime, and the records of the public tribunals are searched in vain for any evidence of effective redress." "The courts are in many instances under the control of those who are wholly inimical to the impartial administration of law and equity." I say it NOW, Tuesday, December 23, 2014!!! Justice William O. Douglas said it in 1961 and 1967. Mr. Lowe of Kansas and Mr. Rainey of South Carolina respectively said respectively said it originally in 1871 at the passage of the Civil Rights Act of 1871 (now codified in Federal Statute laws as Civil 42 U.S.C. § 1983 and 1985). The median annual wage earned by 53-7081 Refuse and Recyclable Material Collectors as of 2013 was $35,280, according to the Bureau of Labor Statistics. The median annual wage earned by 33-3051 Police and Sheriff's Patrol Officers as of 2013 was $58,720, according to the Bureau of Labor Statistics. The median annual wage earned by 33-2011 Firefighters as of 2013 was $48,270, according to the Bureau of Labor Statistics. At the age of 50 you retire - take the amount of years you worked multiply by 3 and that is the percentage that you get of your salary at time of retirement ..